Initializing organization by XML configuration Introduction to the OrganizationService component, PicketLink, LDAP and instructions on how to initialize entities via XML configuration. Working with organization API Instructions on how to work with organization API to implement some works related to entities, including Managing users, Managing groups, Assigning users to a group, and Setting auto-membership for users. Organization listeners General knowledge of Organization Service, and step-by-step instructions on how to write Organization listeners, pack them into a .jar, and deploy them into eXo Platform. OAuth providers integration A tutorial to integrate with external OAuth providers like GitHub. Developing your own validator A tutorial about how to customize a data validator. The OrganizationService component is used to manage entities in eXo Platform. It is responsible for creating/retrieving/updating/deleting them. Users, groups and roles in a database. Users, groups and roles in a LDAP directory. Users in a LDAP directory, groups and roles in a database. Users in multiple LDAPS, groups and roles in a database. The default configuration of PicketLink in eXo Platform manages everything in a database. eXo Platform comes with some examples to manage the Organization entities in a LDAP. You can find these examples in portal.war/WEB-INF/conf/organization/picketlink-idm/examples. Refer to LDAP integration using PicketLink for more details about LDAP. To specify the initial Organization configuration, you first need to declare the org.exoplatform.services.organization.OrganizationDatabaseInitializer plugin in the configuration of your custom-extension.war. This plugin is used to specify a list of membership types, groups and users to be created. The following snippet allows creating a membership, a group and a user via the org.exoplatform.services.organization.OrganizationDatabaseInitializer plugin. You need to pay attention to the object type to know which attributes can be declared in the field tags. Managing users How to create/remove a user and remove membership of a user. Managing groups How to create/update/remove a group. Assigning users to a group How to assign a user to an existing group. Setting auto-membership for users How to set a membership for a newly created user. Create a Maven portlet project to follow the snippets in the next sub-sections. PRODUCT manages identification and authorization with the entities packaged in org.exoplatform.services.organization, including user, user profile, group, membership type (also known as “role”), and membership. See more about these entities in the Organization API. Directly inline, via the UI of eXo Platform. To create a user, see the Adding a user section for more details. To update and remove a user from the portal, see the Managing users section for more details. Create a portlet action, then add the snippet below to it. 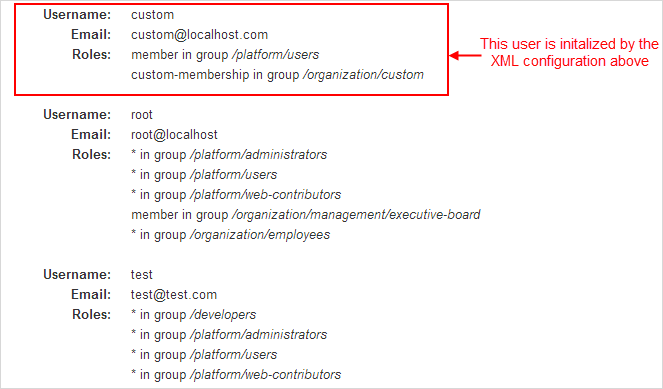 Executing the portlet action allows creating a user called newuser whose role is member:/platform/users. Create a portlet action which executes the snippet below to remove an initialized user, for example, newuser. Directly inline, via the UI of eXo Platform. See the Managing groups section for more details. Executing the portlet action allows creating a group called newgroup which is the child of the platform group. After creating a group, you should update a label for it as its display name. The snippet above allows setting the New Group Updated label for the newgroup group. Directly inline, via the UI of eXo Platform. See the Adding a user to a group section for more details. In your extension, via the configuration. In Creating a user, you can see that while creating the newuser user, the user is assigned to the /platform/users group and the member membership. In eXo Platform, when a new user is registered, the membership: member:/platform/users will be automatically granted to him/her. See Predefined users, groups and memberships to futher understand the membership concept. With the extension mechanism provided by eXo Platform, you can set another auto-membership for users. custom-extension.war!/WEB-INF/conf/organization. 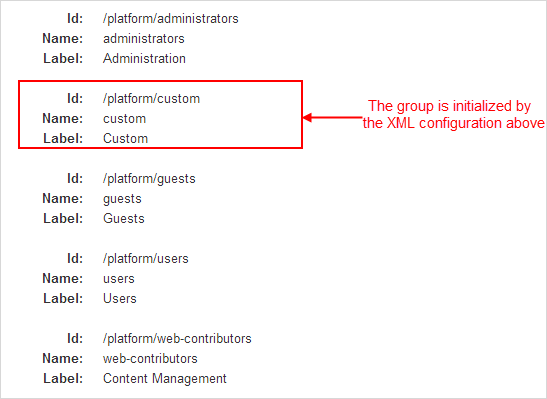 See the sample content of complete configuration in the platform-extension.war!/WEB-INF/conf/organization/organization-configuration.xml file. Create a new user, for example “katie”, without assigning her to any group. Then, userHandler will broadcast an event to org.exoplatform.services.organization.impl.NewUserEventListener which will assign the created user to the /platform/users and /platform/web-contributors groups with the member membership type. Check the membership for the newly created user by selecting –> Users –> Community –> User Management. Next, click corresponding to your newly created user (for example, “katie”), then select User Membership. You will see that 2 memberships are auto-assigned to “katie”. In eXo Platform, whenever an action occurs (for example, login/logout, content creation/modification), a corresponding event is sent to Listener Service that dispatches the notification to its listeners. Listeners then can perform whatever action they want when receiving an event. See Listener Service events for more details. In this section, you will have opportunity to learn about Organization listeners, how to write and pack them in a .jar file, then deploy them into eXo Platform based on the extension mechanism of eXo Platform. A user is created, deleted, modified, enabled or disabled. A group is created, deleted or modified. A membership is created or removed. This mechanism is very useful to cascade some actions when the organization model is modified. For example, it is currently used to initialize the personal portal pages or to create drives and personal areas. In term of working mechanism of Organization listeners, it is quite similar to that of Listener Service. See Understanding the Listener Service for how it works and how to configure a listener in general. Implement your own listeners by extending some existing listener classes in src/main/java/org/exoplatform/listener. These classes define hooks that are invoked before or after operations are performed on the organization model. To listen to user changes, you need to extend org.exoplatform.services.organization.UserEventListener in MyUserListener.java. 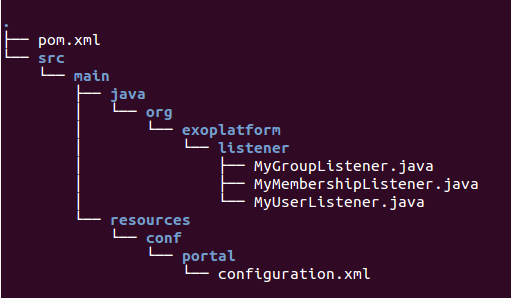 To listen to group changes, you need to extend org.exoplatform.services.organization.GroupEventListener in MyGroupListener.java. To listen to membership changes, you need to extend org.exoplatform.services.organization.MembershipEventListener in MyMembershipListener.java. Register your own listeners in configuration.xml. Registering the listeners is then achieved by using the ExoContainer plugin mechanism. See Service configuration for beginners for more information. To effectively register Organization listeners, you simply need to use the addListenerPlugin set-method. Build your JAR project, then deploy the .jar file (in target/) under eXo Platform. Start eXo Platform. Your own listeners are now ready for testing. To check if either of your own listeners takes effect, try the case when creating a new account by selecting –> Users –> Add Users. Once you have clicked Save, two strings will be printed to the console: “Before user is added into database” and “After user is added into database”, as defined in MyUserListener.java. The OAuth 2.0 specification, RFC-6749 by IETF, is an open standard for authorization. It allows resource owners to authorize third-party access to their server resources without sharing their credentials. To explain this definition, let’s say a GitHub user wants to allow a third-party application to access their GitHub data like the profile and repositories. In a traditional way, the user will give the application his username/password. This approach has some defects. For instance, there is no way to identify the application, thus impossible to limit the access. If the user wants to stop using an application, he must change the password, so other applications will be disallowed as well. In OAuth approach, the third-party application must be registered to (so identified by) GitHub. When the app requests the resources for the first time, GitHub prompts the user so he can allow or refuse the access. On the allowance, the app receives an access token - not the user credentials, and uses it to proceed to access the resource. By this way, the user can revoke the access anytime. Depending on the OAuth implementation, it can give a policy based on that the user can choose which resources are accessible. This example just explains OAuth quickly. Please read RFC-6749 to understand the roles and the flow before you continue. The term “OAuth integration” suggests that you can write applications that run at eXo, and access resources from another resource server by getting authorized by an OAuth provider. To avoid a wide topic of data propagation that it may imply, this tutorial only focuses on how to allow users to sign up/log into eXo using other Social network accounts. As of 4.3, eXo supports login by Facebook, Google+, LinkedIn and Twitter. These four networks are built-in supported. The integration can be turned on/off by configuration. When a user logs in using a Social network account, his profile data is propagated into eXo. Access token persists for re-using. Revocation and expiration are handled. The great point is, the framework allows extending the provider list. In this tutorial you write an addon that allows GitHub users to sign in. The GitHub OAuth flow and other information you need can be found at https://developer.github.com/v3/oauth/. You should read it before you continue. At the moment, it is not clear which scopes are supported. However, the addon will need only the (default) user scope, so it does not matter. It is good to know that you can test the flow completely before writing any code. The tip is to use a browser plugin, such as Chrome Advanced Rest client. For that test, when registering your app, you should set the callback URL to your localhost. You can change it anytime later. In order to see all things work perfectly, you can set up an Apache/Nginx server to return a default page at port 80. When you start coding, this tutorial requires you to run an eXo instance at localhost:8080 for simplification. So at that time, change the callback URL to this address. In your test the actual value should be http://localhost:8080/portal/githubAuth. In production it depends on the eXo base URL, so it should be a configuration. service contains Java classes, service configuration and translation resources. This module is packaged in jar. extension is a webapp (war) containing stylesheet configuration and resources. packaging module that packages the jar and the war in a zip to satisfy the Addon packaging requirement. A processor that handles the interaction with GitHub. Write an interface, called GithubProcessor for the major service - that should indeed implements the general org.gatein.security.oauth.spi.OAuthProviderProcessor interface. You need this extended interface for two reasons: 1. to satisfy the key-type pattern of eXo services, and 2. to add any methods you want for GitHub in particular. The framework that manages the interaction with the GitHub servers will call the following method of the processor through the flow, passing it the request and response of each phase, and expecting an InteractionState in return. Write a Filter, called GithubFilter, that extends the abstract filter org.gatein.security.oauth.web.OAuthProviderFilter. This must implement the following three methods, in which the last one is called when the authorization is finished. You obtained an access token to get the GitHub user profile and return the user attributes wrapped into an OAuthPrincipal object. You can use any preferred libraries here to get the profile resouces. This tutorial simply uses java.net.HttpURLConnection and org.json.JSONObject. Configure the service and filter to be loaded by the portal container, and register new provider as a plugin to the framework. While typically such configuration is placed in an extension, in this case it must be configured in a jar to be loaded before portal.war. TODO: Should not expose property for this value. # Used in AccountPortlet (when registering new user). # Used in OrganizationPortlet (when editting a profile from the Administration menu). # Used when a user edits his profile from Settings menu. In UI when viewing a user profile, these keys are used to label the GitHub account fields. See the inline comment. This CSS is applied to the login page. The framework automatically adds elements with class “github” (lowercase) to the page, so the CSS selectors are fixed. For the extension configuration and the packaging, refer to eXo Add-ons chapter. The redirectURL parameter is generated based on exo.base.url property. You do not need to configure it while testing localhost:8080. The user-configurable validator is implemented by the org.exoplatform.webui.form.validator.UserConfigurableValidator class. where validatorName is a String that must match a validator name configured in exo.properties file. You can see more codes of adding a validator to a field via UIAccountProfiles.java. In which, localizationKey is defined in a resource bundle.